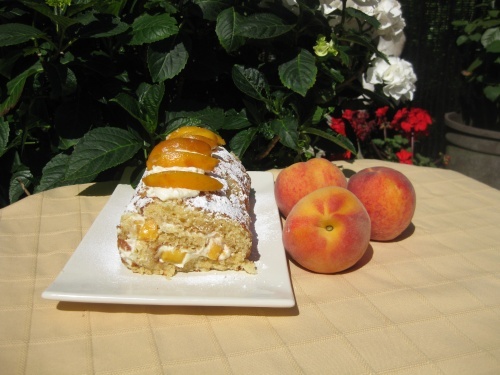 A honey flavoured sponge with peaches and cream makes a delicious summer cake. To roll a sponge is not at all difficult, and even if it cracks it doesn’t matter. It looks very special. When fresh peaches are unavailable canned ones can be used. You will need a swiss roll tin measuring 30 x 23cm/12 x 9ins and silicone baking parchment also a piping bag and star tube. Line the tin with silicone baking parchment. Heat the oven to Gas 5/190C. Melt the butter and leave it to cool. Sieve the flour onto a plate. In a bowl over a pan of hot water beat the eggs and sugar until very thick. When the whisk is lifted from the mixture it should have a thick trail. Whisk in the honey. Using a large metal spoon fold in the flour and melted butter alternately. Spread it in the tin and bake for 12-15 minutes approx. or until a fingertip touch leaves no imprint. While it is cooking place a damp teatowel on the work surface with a piece of paper on top. When the sponge is cooked, invert it onto the paper and carefully remove the lining paper. Using a long sharp knife trim the barest edges all round the sponge, this will make it easier to roll. Take a piece of paper the same size of the cake and place it on top. At a short end make a cut halfway through, one inch from the end. Press the end over and continue to roll with the paper inside, holding the under paper as you roll, finishing with the end underneath. Wrap the paper round it to leave to cool. If using fresh peaches skin them and slice. Reserve a few slices to decorate the finished cake and chop the remainder. When the cake is cold, unroll (don’t worry if it cracks) and spread with honey. Whip the cream to soft peak only. Fold in 1 tablesp of honey, put 2 tablesp into the piping bag with the star tube and spread the remainder over the sponge with the chopped peaches. Re-roll the sponge. Brush with honey, decorate with peaches and cream.